There is no denying that Firaxis knows how to make an addictive game. Like its predecessors, Civilization V is addictive, fun, and engrossing. The first expansion, Civilization V: Gods and Kings, packed a surprising amount of content for an expansion. Firaxis just announced in a press release that the next expansion for Civilization V will be titled "Brave New World." Like Gods and Kings before it, Brave New World will be loaded with extra content. It will also introduce new ways to play the game and carve your way to victory. - New Civilizations, Units and Buildings: The expansion features nine new civilizations, each with unique traits, units, buildings and all-new leaders, including Casimir III of Poland. - New Culture Victory: Spread your culture across the globe, dominating all other cultures. Create masterpieces with Great Artists, Writers, and Musicians that are placed in key buildings across your empire, like Museums, Opera Houses and even the Great Library. Use Archaeologists to investigate sites of ancient battles and city ruins for priceless cultural artifacts. Become the first civilization with a majority influence in all other civilizations to achieve a Culture Victory, becoming the envy of the world. - World Congress: The importance of diplomacy is intensified and city-state alliances are more important than ever. Change the diplomatic landscape through a new World Congress that votes on critical issues like implementing trade sanctions against rogue nations, limiting resource usage, designating host cities for the World Games and the use of nuclear weapons. Game-changing resolutions, vote trading, intrigue, and a new lead into the Diplomatic Victory ensures that the end of the game will be more dynamic than ever before. - International Trade Routes: Build your cities into hubs of international trade by land and sea, creating great wealth and prosperity for your people, while also spreading religion, cultural influence, and science. The number of trade routes increases through the advancement of economics and technologies, the creation of wonders and the unique abilities of your civilization. Will you connect to a closer city for a lower payoff and a safer route, choose a longer route with more risk for the bigger payoff, or perhaps point your trade route inward, sending vitally important food and production to the far corners of your own empire? - New Wonders: Eight new Wonders are introduced, including the Parthenon, Broadway, the Uffizi, and more. - New Game Scenarios: Two new scenarios let gamers fight the “War Between the States” and embark on the epic Scramble for Africa. Fight the American Civil War from either the Union or Confederate side, as you focus on the critical action in the Eastern theatre of operations between the capital cities of Richmond and Washington. In “Scramble for Africa”, the great colonial powers of the world are racing to explore the Dark Continent and extend their reach into its interior. Search for great natural wonders in the heart of Africa, as you explore a dynamically-generated continent each time you play. If Civilization V: Gods and Kings is any indicator of the amount of quality content we can expect from this next expansion, then we should all be looking forward to this release. 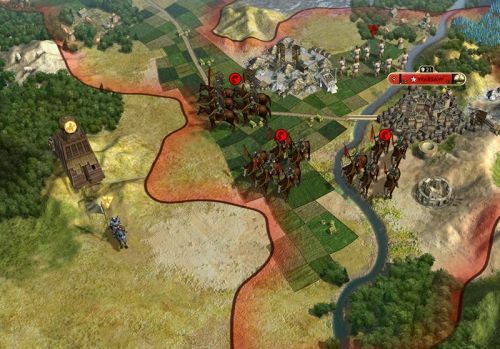 Civilization V: Brave New World is scheduled for a Summer release at an undetermined date. It will be released for both the PC and Mac for $29.99. Like the original before it, the game can be played with up to three players online or via LAN against an AI opponent. Page created in 1.6035 seconds.